Any SS you took w/o a score of yourself in a cool position. Like in mid air in a jump, or sth like that? I need mainly male skins, or some with non metal guard female. But those are welcome as well. I want to make a render pack for UT99 because I can't find any and I'm always cutting them out myself from SS...Some UT99ers might find them useful. P.S. If anyone would like to let me use them as a model with a skin or 2 that would be verrrrrrrrrrrry helpful! moko, have I got one for you....the flip-bounce glitch in ut. 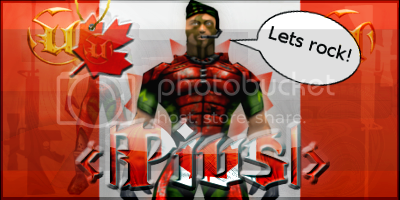 Renders are pictures that normally have a transparent BG, like in Pius's signature it has the guy in there, that's a render. yeah, I'll bust out a photo shoot with one of my models. Lol, that means you wear a skin and run around and I take SS, and cut out the ones I like. If you look at Melted's signture the people are all him, he ran around a map with the skin he wanted and I ss him>Cut him out. My signature atm is me, I took a ss after a CTF match and cut me out. Last edited by Moko; 07-15-2011 at 01:18 PM.